Numbered Class Packs are valid for 3-months from first use. All sales are final. # Session Packs Can be shared with family members / friends. Ensure you have created an account in our scheduling system. Class packs bought here will be placed in your scheduling account for use. It is a two step process! * Buy Now. Use Later. 1 Per Customer. Personal Training sessions start at $65 per session. 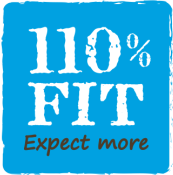 Contact info@110FIT.com for a FREE assessment and more info.